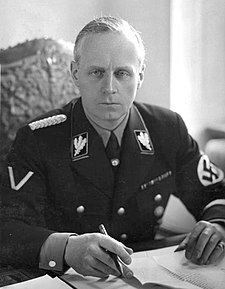 SS-Obergruppenführer Ulrich Friedrich Wilhelm Joachim von Ribbentrop (30 Aprile 1893 – 16 October 1946) wis Foreign Meenister o Nazi Germany frae 1938 till 1945. Ribbentrop first cam tae Adolf Hitler's notice as a weel-traivelled businessman wi mair knawledge o the ootside warld than maist senior Nazis an as an authority on warld affairs. He offered his hoose for the saicret meetins in Januar 1933 that resultit in Hitler's appyntment as Chancellor o Germany. He becam a close confidant o Hitler, tae the ugg o some party members, that thocht him superfeecial an lackin in talent. He wis appointed Ambassador tae the Coort o St James (for the Unitit Kinrick o Great Breetain an Northren Ireland) in 1936 an then Foreign Meenister o Germany in Februar 1938. Afore Warld War II, he played a key role in brokerin the Pact o Steel (an alliance wi Fascist Italy) an the Molotov–Ribbentrop Pact (the Nazi–Soviet nan-aggression pact). He favoured reteenin guid relations wi the Soviets, an opponed the invasion o the Soviet Union. Efter 1941, Ribbentrop's influence declined. Arrestit in Juin 1945, Ribbentrop wis tried at the Nuremberg trials an convictit for his role in stairtin Warld War II in Europe an enablin the Holocaust. On 16 October 1946, he becam the first o thae sentenced tae daith bi hangin tae be executit. This page wis last eeditit on 5 Juin 2018, at 23:31.